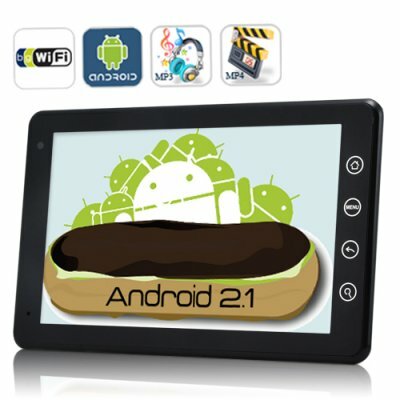 Successfully Added Eximus - Android 2.1 Tablet with 7 Inch Touchscreen and WiFi to your Shopping Cart. Meet the Eximus 7 Inch Android Internet Tablet, a new gadget for the new year and the smartest tablet solution around. With Android 2.1, WiFi, a 7 inch touch screen, and powerful hardware, you have the best way to experience the web, email, media, ebooks, games, and everything else. Anything is possible with the Eximus - let it make your life easier. A portable experience like no other: Everything just became a lot easier with the Eximus 7 Inch Android Tablet. Browse the internet using WiFi, watch videos on YouTube, read ebooks, send emails, play your favorite games - do whatever you want, when you want. Thanks to the 800x480 resolution and crystal clear 7 inch touch screen, all the details look more beautiful and crisp than ever - a true feast for your eyes. Powerful enough for everything: Haven't heard of Android? It's only the most popular operating system in the world and includes true multi-tasking, widgets, and many more features that can't be found anywhere else. It also comes packed with convenient applications such as email, YouTube, MSN, and of course the official Google Marketplace, which is home a huge selection of third-party applications for any purpose - work, personal, or entertainment. Best of all, with the Eximus running on Android 2.1, you can be sure everything will work on this baby. High quality, low price: With a powerful 720MHz processor and 256MB of RAM, the Eximus Android Tablet will easily keep up with your every action and command. Programs load faster, games play smoother, and you can feel the difference in quality and know that you have a top-of-the-line device in your hands. Best of all, this affordable Android Tablet is the best bang for your buck today and brought to you at a factory-direct price that can't be matched. How do we do this? By cutting out the middle man and selling to you factory-direct with no markup and no extra fees! Why do some apps not work on the Eximus Android Tablet? Yes! Everything you see is everything you get! This is a true Android 2.1 Tablet with a 7 inch touch screen, 720MHz processor, 256 MB of RAM, WiFi, and the Google Android Marketplace ready for you to directly download apps! on 2011-03-05 07:49:28 Great tablet,play games including some ps1 emulator games. Excellent and responsive screen sometimes makes me forget the stylus .Compatible with huge amount of apps paid and free ,compatible with all emulators gensoid,snesoid,Psx4droid ,nesoid,etc. With 5 and half hour of costant battery life use on wifi.Working youtube player, gsensor and syncing with googles services,fully working android market ,customize background with animations ,favorites photos,widgets,great video player,great wifi capability,listen to pandora radio,tunein etc. This tablet is great and loaded with real Android 2.1 I would like to order for my friends if this baby is still made available.Thanks a lot Chinavasion. just received this tablet, i would not be able to finish telling you how happy i am with this item, the only thing is that is not available anymore !.... lastima margarito!, ... just hope chinavasion start selling this tablet very soon and one with 3g or gsm sim and camera would be great !!! viva mexico! This tablet does what it says on the tin. Quck response, all apps are available with the 2.1 android OS. Wifi connected straight away. Cool design. Would highly recommend. Thanx Chinavasion again.